At the new DigitalMarketingOne, our Founders Council is seeking to design and explore a strategic framework for digital marketing. Marketing does so many things though and does them so differently at different companies. How do we put all that into a framework that makes sense to CMOs – our target audience? Luckily, many clever people have thought about that before. 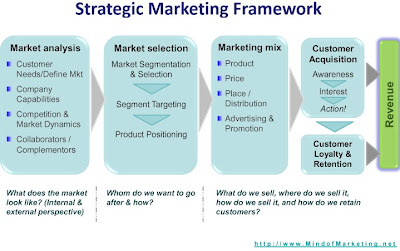 The Strategic Marketing Framework presented on MindofMarketing.net (see below) was one of many frameworks that seemed especially appropriate for a CMO audience. It should serve as a great starting point. Emphasizes that the job of Marketing is much more than just to be the “Hey, make this pretty and send us the leads!” department. While digital can’t beat traditional advertising media on reach, its unique strength is interactivity. So, let’s expand the traditional marketing mix’s classic 4 Ps: Product, price, placement, and promotion. Namely, let’s drill open promotion to show just how much is possible within that one P in digital. Let’s add the Ps that are so key to digital marketing: persuasion, permission, personalization, multiple web presences, net-promoters, etc. Rumors of the death of advertising in the digital age are greatly exaggerated: ads are everywhere on the net. But there is an immense amount of unique know-how within each of the digital ad channels. We should call out the most important channels in the framework to do that justice. Digital media are fantastically measurable. Optimization within a channel can sometimes even be automated. That creates the illusion that it should be almost automatic to measure overall ROI / returns across digital and allocate your investments appropriately. Not so easy! Therefore let’s add ROI measurement and optimization to the framework explicitly. Below is the resulting strategic marketing framework with the modifications for Digital. Does this framework do a good enough job to encapsulate all that goes into measuring and increasing ROI (with marketing initiatives and customer relationships) in digital? Once we have the framework down, we can proceed to the next step and explore the details with the help of DigitalMarketingOne’ers from all corners of Digital. Three wizards to help you optimize web marketing. You think you are customer-centric and data-driven. But are you really? The Fourth Digital Analytic Revolution is On! The postings on this site are my own and don’t necessarily represent my employer's positions, strategies or opinions. Copyright © 2007-2010 Multichannel Marketing Metrics. YellowJacket design by Antbag.